He was credited with revitalizing its institutions, crafting what he called a new “norm of humanitarian intervention,” particularly in places where there was no peace for traditional peacekeepers to keep, and, not least, in persuading Washington to unblock arrears withheld because of the profound misgivings about the body voiced by American conservatives. His tenure was rarely free of debate, and he was likened in stature to Dag Hammarskjold, the second secretary general, who died in a mysterious plane crash in Africa in 1961. In 1998, Mr. Annan traveled to Baghdad to negotiate directly with Saddam Hussein over the status of United Nations weapons inspections, winning a temporary respite in the long battle of wills with the West but raising questions about his decision to shake hands — and even smoke cigars — with the dictator. In fact, Mr. Annan called the 2003 invasion of Iraq illegal and suffered an acute personal loss when a trusted and close associate, the Brazilian official Sérgio Vieira de Mello, his representative in Baghdad, died in a suicide truck bombing in August 2003 that struck the United Nations office there, killing many civilians. The attack prompted complaints that Mr. Annan had not grasped the perils facing his subordinates after the ouster of Mr. Hussein. While his admirers praised his courtly, charismatic and measured approach, he was hamstrung by the inherent flaw of his position as what many people called a “secular pope” — a figure of moral authority bereft of the means other than persuasion to enforce the high standards he articulated. As secretary general, Mr. Annan, like all his predecessor and successors, commanded no divisions of troops or independent sources of income. Ultimately, his writ extended only as far as the usually squabbling powers making up the Security Council — the highest U.N. executive body — allowed it to run. In his time, those divisions deepened, reaching a nadir in the invasion of Iraq. Over his objections, the campaign went ahead on the American and British premise that it was meant to disarm the Iraqi regime of chemical weapons, which it did not have — or, at least, were never found. 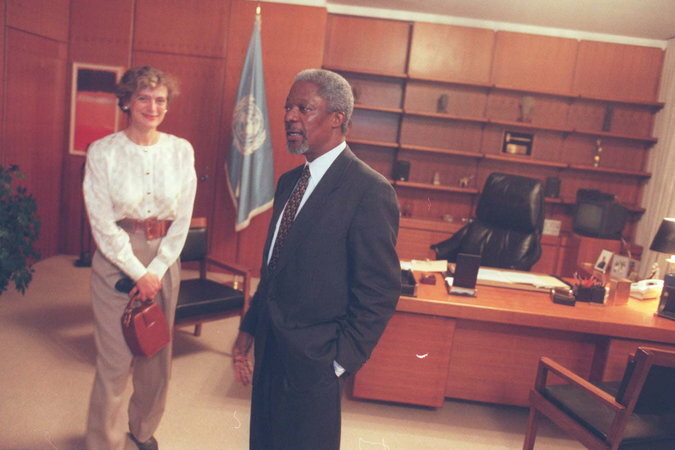 Mr. Annan and his wife, Nane, in his office 1997, the year he became secretary general of the United Nations. Iraq also brought embarrassment closer to home when reports began to surface in 2004 that Mr. Annan’s son, Kojo Annan, worked for Cotecna Inspection Services, a Geneva-based company that had won a lucrative contract in a vast humanitarian program supervised by the United Nations in Iraq and known as oil for food. A commission led by Paul A. Volcker concluded that the secretary general had not influenced the awarding of the contract, but had not investigated aggressively once questions were raised. The secretary general said he took the commission’s findings as exoneration, but his reputation suffered, particularly in the eyes of adversaries in Washington. In assessing his broader record, moreover, many critics singled out Mr. Annan’s personal role as head of the United Nations peacekeeping operations from 1993 to 1997 — a period that saw the killing of 18 American service personnel in Somalia in October 1993, the deaths of more than 800,000 Rwandans in the genocide of 1994, and the bloody massacre of 8,000 Bosnian Muslims by Bosnian Serb forces at Srebrenica in 1995. In Rwanda and Bosnia, United Nations forces drawn from across the organization’s member states were outgunned and showed little resolve. In both cases, troops from Europe were quick to abandon their missions. And in both cases, Mr. Annan was accused of failing to safeguard those who looked to United Nations soldiers for protection. Despite the serial setbacks, Mr. Annan commanded the world stage with ease in his impeccably tailored suits, goatee beard and slight, graceful physique — attributes that made him and his second wife, Nane Lagergren, a global power couple. The desire to burnish his legacy seemed to motivate Mr. Annan long after Ban Ki-moon replaced him as secretary general, and he set up a nonprofit foundation to promote higher standards of global governance. In 2008, he headed a commission of eminent Africans that persuaded rival factions in Kenya to reconcile a year after more than 1,000 people were killed during and after disputed elections. In February 2012, Mr. Annan was appointed as the joint envoy of the Arab League and the United Nations to seek a settlement as civil war tightened its grip on Syria. But he resigned in frustration in August of that year, citing the intransigence of both sides in a conflict that convulsed and reshaped the region and claimed hundreds of thousands of lives. Kofi Atta Annan was born on April 8, 1938, in the city of Kumasi in what was then Gold Coast and which, in 1957, became Ghana, the first African state to achieve independence from British colonialism. Born into an aristocratic family, he had three sisters, two of them older. The third, Efua, was a twin who died in the 1990s. After a spell at the elite Mfantsipim boarding school founded by Methodists, he went on to higher education as an economist in Ghana, at Macalester College in St. Paul, in Geneva, and at the M.I.T. Sloan School of Management. 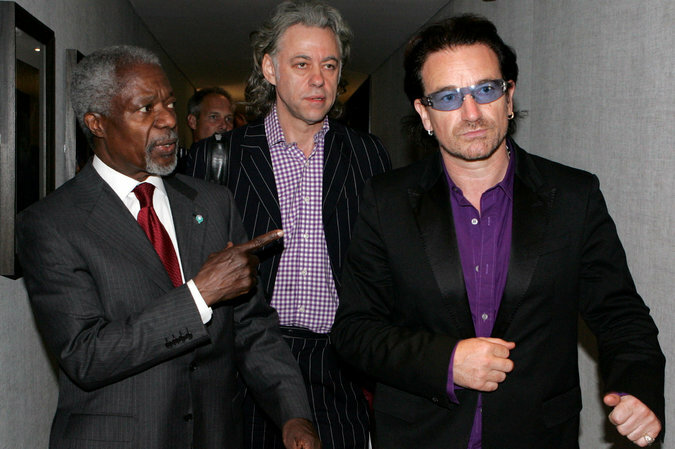 Mr. Annan with Bob Geldof and Bono for a session of the G-8 summit meeting in Gleneagles, Scotland, in 2005. In 1965, he married Titi Alakija, a woman from a prosperous Nigerian family. The couple had two children, a daughter, Ama, and a son, Kojo. The marriage foundered in the late 1970s. In 1984, Mr. Annan married Ms. Lagergren, a divorced lawyer working at the United Nations. She, too, was a scion of a prominent family, a niece of Raoul Wallenberg, the Swedish diplomat who protected thousands of Hungarian Jews during World War II but disappeared after being captured by Soviet forces. Ms. Lagergren had a daughter, Nina, from her first marriage. He is survived by Ms. Lagergren, along with Ama, Kojo and Nina. His first appointment with a United Nations agency was in 1962, at the World Health Organization in Geneva. Mr. Annan returned briefly to Ghana to promote tourism and worked in Ethiopia with the U.N. Economic Commission for Africa before returning to the body’s European headquarters. Later, in New York, he worked at first in senior human resources and budgetary positions, and, in the early 1990s, the former secretary general, Boutros Boutros Ghali of Egypt, appointed him first as deputy, then as head of peacekeeping operations. The appointment plunged Mr. Annan into a maelstrom of conflicts where United Nations forces were deployed. As genocide approached Rwanda in 1994 — months after the downing of a Black Hawk helicopter in Mogadishu, Somalia, and the killing of American service personnel — the Clinton administration in Washington had little appetite for intervention. In Bosnia, too, the United Nations was accused of being overcautious and restricted by the mandate approved by the Security Council for the establishment of so-called safe havens under United Nations protection that proved, in Srebrenica, to be illusory. European powers opposed airstrikes to halt the advancing Bosnian Serbs, who overran Srebrenica despite the presence of peacekeeping troops from the Netherlands. Later that year, Mr. Annan seemed to adopt a tougher line, approving the NATO bombing campaign that forced Serbia to the negotiating table for the Dayton peace accords. At that time, airstrikes required a so-called dual key approval of the NATO command and the United Nations. “When Kofi turned it,” Richard Holbrooke, the former American envoy, told Mr. Gourevitch, “he became secretary general in waiting.” With Washington pressing for the ouster of Mr. Boutros Ghali, Mr. Annan took office as secretary general with American approval on Jan. 1, 1997. He was, Ms. Power wrote, “the primary guardian of the U.N. rule book,” which insisted on the paramountcy of the Security Council as what Mr. Annan called “the sole source of legitimacy” in approving overseas interventions. Those rules were openly flouted by NATO in March 1999, with its bombing of the former Yugoslavia, forcing Mr. Annan to seek some kind of middle ground. “We will not, and we cannot accept a situation where people are brutalized behind national boundaries,” he continued later as the 78-day aerial campaign ended its second week of efforts to halt a crackdown on ethnic Albanians in Kosovo.